BenchMark® dot-peen marking systems, proudly manufactured in the U.S. by Telesis Technologies, enable you to easily achieve quality, permanent part marking virtually anywhere you need it. Whether you have only an occasional need for marking, or if you need a marking capability in various locations, the BenchMark series is ideal. All BenchMark systems are designed for easy set-up and immediate use, right out of the box. Since these systems are built on electromechanical pin designs, you can use these benchtop or handheld markers wherever you need them, unrestrained by the air supply lines competitors often use. The fully-integrated but compact BenchMark controller does not require connection to a PC. This proven controller is a separate unit, allowing for easier maintenance and providing easy programming with broad functionality. The BenchMark® 200 is an extremely economical, fully programmable alternative to old-fashioned permanent marking techniques. This complete system, with self-contained controller and extruded aluminum marking head mounting post and base, is the right choice for many stand-alone bench top marking applications. An electromechanical marking pin eliminates the need for any air supply, making it easy to move the BenchMark® 200 from one work area to another. 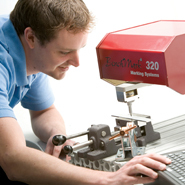 The BenchMark® 320 is an extremely versatile yet economically priced benchtop marking system. It offers a generous 4” x 6” (100mm x 150mm) marking window large enough to satisfy almost any application. And its unique marking arm design is extremely convenient for parts loading and unloading as well as marking pattern design. The system is self-contained with compact controller and rugged extruded aluminum mounting post and base. The BenchMark® 460 is a fully programmable, cost effective alternative to old-fashioned permanent marking techniques for parts too large or heavy to be carried to a marking station. Its hand-held marking head is lightweight and ergonomically designed, while providing a generous 1˝ x 4˝ (25mm x 100mm) marking window. An electromechanical marking pin eliminates the need for any air supply, making the BenchMark® 460 truly portable.